Scottscope: Robert Freeman At Long Last Finds Happiness With The "Lovely Ebony Brown"
Robert Freeman At Long Last Finds Happiness With The "Lovely Ebony Brown"
The love life of Robert Freeman has been a freak show of epic proportions. The long suffering Huey and Riley have had a front row seat as Granddad's questionable taste in women has brought all manners of weirdos into their home. 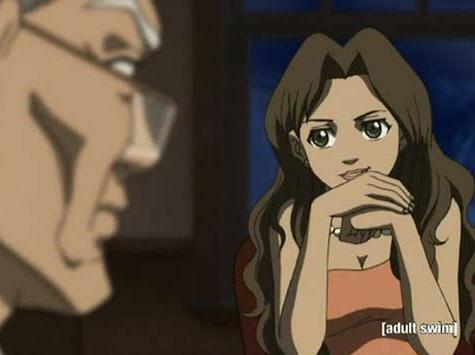 While this has provided ample fodder for low brow humor, The Boondocks has had yet to show us what is driving Robert's bizarre forays into the modern dating scene. "Lovely Ebony Brown" adds a bit of closure to the situation, as well as a silver lining (sort of). After many failed attempts at meeting women via online dating and social networking sites, Robert dismantles his Facebook page in disgust. While jogging in the park with Tom Dubois and Uncle Ruckus, he sees his vision of perfection in the young and beautiful Ebony Brown. He is immediately smitten. Their first date confirms that she is indeed as perfect as she appears, but self doubt and second guessing prevent Robert from being truly happy with her. "Lovely Ebony Brown" is the second episode in a row to focus on Robert Freeman. It reveals a level of insecurity in the character that wasn't evident before. For all of his wisdom and experience, Robert is prone to the same self destructive tendencies as the rest of us. He searches for true happiness, yet he is unable to enjoy it once he has it. Ebony simply seems too good to be true. The fact that she is genuinely into him brings all of his insecurities brimming to the surface. 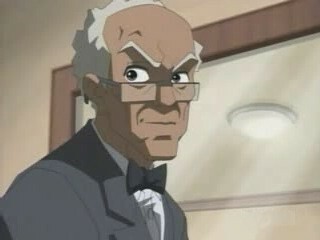 The episode also features some sly commentary on the rather bleak outlook that many black men harbor about black women. Ebony is beautiful, educated, accomplished and selfless. The perpetually self hating Ruckus works overtime trying to convince the lovestruck Robert that such a black woman could never exist. Riley also gives his granddad the worst advice imaginable. As always, only the introspective Huey seems able to see the situation for what it is. As far as pop culture references go, there is a sly jab at the museum trip in Ferris Bueller's Day Off that fits in perfectly with the story and themes of the episode. "Lovely Ebony Brown" is both funny and unexpectedly touching. Its central message proves useful not only for granddad, but for all of us. Perhaps Robert has his hands so full with Huey and Riley that he never finds the time to examine himself and figure out what he really wants. Such is the life of many of America's single parents. Sometimes we are so focused on our responsibilities that we never bother to try and figure out what would make us happy, or what we would do once we attained the happiness we seek. The last line sums it up the best for me. The two things that really hit me from this episode are 1. Everybody wants "happiness" and to find it with the "right one" but very few of us, if any, would know how to actually handle that happiness if we actually found it. 2. The perspective ideals that exist about men and women within the black community derails our relationships either before they begin or very soon afterward. In many ways Robert dooms himself. He became very self conscious of dating Ebony due to his age and lack of "buffness" but all he has EVER chased after have been younger women. Therefore Gruber and company did a great job of showcasing the point of how people put themselves in sabotaging situations when it comes to relationships....a very thoguthful episode.